Until now, there have been occasional rumors of moose (Alces alces) in Westborough, triggered perhaps when someone saw an especially large hoof print in mud or snow or a pile of droppings that looked suspiciously larger than a deer’s. But two weeks ago, the collision shortly after midnight September 22 between a moose and three vehicles – two cars and a Mack truck – on Route 9 in Westborough (near Speedway Plaza) gave proof that moose can venture into in Westborough and perhaps neighboring towns. This collision was deadly, but only for the moose. One person was injured and taken to the hospital, and all three damaged vehicles were towed away. Local drivers know that deer can be a hazard on local roads, but now we’re all on notice that we have to watch out for moose as well. Striking a moose is especially dangerous. Why? These animals are so tall and long-legged that a collision with car often knocks the legs out from under the moose and slams its 400-800-pound body through the windshield or onto the roof. The results can be serious or fatal for people inside the car. With an estimated moose population of 1,100 today, Massachusetts has recorded three fatal collisions with moose (in 2003, 2007, and 2012) and more than 60 serious injuries. Moose are especially hard to see at night on roadways because their bodies are dark and they’re so tall that their eyes don’t shine in a car’s headlights. As the second-largest animals in North America (after bison), moose aren’t afraid of much, and they’re not wary when they step out onto roads. They can also appear suddenly. The Route 9 moose, for example, jumped over the barrier in the middle of Route 9 to land in the west-bound lane. So be on the lookout for moose, drive slowly, and brake for moose! Heed the moose warning signs that you may see, especially along Routes 2 and 190 in northern Massachusetts. Also pay attention to portable moose warning signs set up temporarily in other areas. The area along the stretch of Rt. 9 where the collision took place is a swampy one that could be attractive to a traveling moose. Moose often feed in wetlands or move through them. Between Rt. 135 (Milk Street) and Otis Street, you can see wetlands (as evidenced by purple loosestrife and phragmites) on either side of Rt. 9. The Assabet River also flows under Rt. 9 near the Milk Street. Moose have no trouble walking through water and can even swim well. They also begin to be stressed by heat when summer temperatures reach 59 degrees (F), so they often go into wetlands to keep cool. The majority of the moose in Massachusetts today live in northern Worcester County. They have been moving back into our state from New Hampshire and Maine since the 1980s, after disappearing from Massachusetts in the early 1700s, probably not long after Westborough was incorporated in 1717. What happened and why are they back? Moose are native to New England (as well as Canada, Alaska, and the northern U.S.). Native Americans hunted them for meat and leather. (The word moose comes from Native American languages.) When European settlers arrived, they too hunted moose and promptly removed the moose’s habitat as they cleared forests to make room for farms. The return of forests in the past several decades and protection from hunting have made Massachusetts a hospitable place for moose once again. Most of us have never been close enough to a moose to appreciate how big these animals are. Adult moose in New England are so big that they basically have no predators. Males weigh an average of 800 pounds and can stand as high as 6-1/2 feet at the shoulder. Females average 600 pounds. 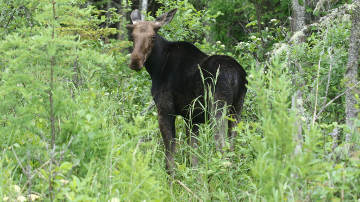 A moose calf is about 25 pounds at birth. The largest moose live in Alaska, where males average 1400 pounds and females 1050 pounds. What do moose eat to support their great size? They’re vegetarians, eating 40-60 pounds of vegetation a day. They feed on aquatic plants, which provide salt as well as calories, and on buds, twigs, and leaves. In winter, they sometimes lick road salt and feed in hemlock stands. Young or regenerating forests and recently logged, cut, or burned areas attract moose due to plenty of sprouting vegetation and new growth. Moose have a special tool of sorts for stripping leaves and twigs off branches – their large upper lip, which is strong and flexible enough to grasp a branch and strip off the leaves, twigs, and buds or to uproot plants. Would you want to get close, say, if a moose showed up in your yard or near a trail? That’s not a good idea. Moose are not peaceful, clumsy Bullwinkle cartoon characters. They are unpredictable wild animals armed with sharp hooves on legs that are 3-4 feet long. They are capable of kicking out in all directions and stomping any animal or person that comes too close. They can charge, and they can run 35 miles per hour. Males don’t like interference when they’re intent on finding a female, and females are fierce in protecting a calf. Moose lead relatively solitary lives and don’t form herds the way deer do. In the breeding season, a few males may follow a female, and rival males may even fight over a female, with antlers clashing. After mating, a male moves on, in search of other females. Females give birth in May-June, usually to one calf but sometimes to twins. Young moose stay with the mother for their first year, until it’s time for a new calf to be born. People sometimes like to find moose antlers in the woods. Only males grow antlers, which develop March through August. The growing antlers are covered by skin and blood vessels which make up the “velvet” on growing antlers. Once the antlers are fully grown, the moose scrapes off the velvet on a tree and may even eat the velvet. Moose shed their antlers after breeding season, in December. Rodents, birds, and other animals often find these antlers and eat them. If you want to keep an eye out for signs of moose in the woods, look for tracks similar to those of deer but 4-1/2 – 5-1/2 inches in size, and for piles of oval-shaped droppings about the size of chocolate-covered almonds.